Paul began racing in the early 1980s. It was not until the late 90s that Paul took on a coach and followed some structured training plans. Racing and general riding excelled. In his mid 40s Paul moved up to a Cat II road cyclist. Racing in the Pro 1/2 category is exhilarating. Performance in his late 40s was better than his 20s! A spark was ignited. Paul earned his USA Cycling Coaching license and began sharing his knowledge with others. Now a USA Cycling Level 2 coach and a Training Peaks Level 1 coach. Sharing his knowledge for more than 15 years has been an extremely rewarding endeavor. Athletes under his wing have grown, excelled, and earned Gold and Silver in state championship races. 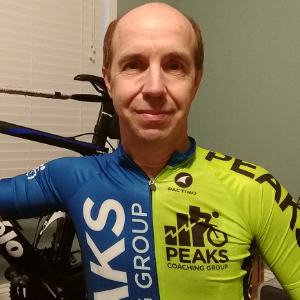 Paul has rejoined Peaks Coaching Group for 2019! Road Racing 20+ years, Cat II on the road. Qualified for NORBA Mountain Bike Championships in 2004, 2008- 2011. Success. Coach Paul Ozier has been notified of your message. Titanium Foundation 2019 - Building a Foundation of Titanium!